In 1975, Virginia E. Miller, Dudley M. Varner, and Betty A. Brown published an important article in The Masterkey, the Journal of the Southwest Museum (Volume 49, No. 2, April-June 1975, pp. 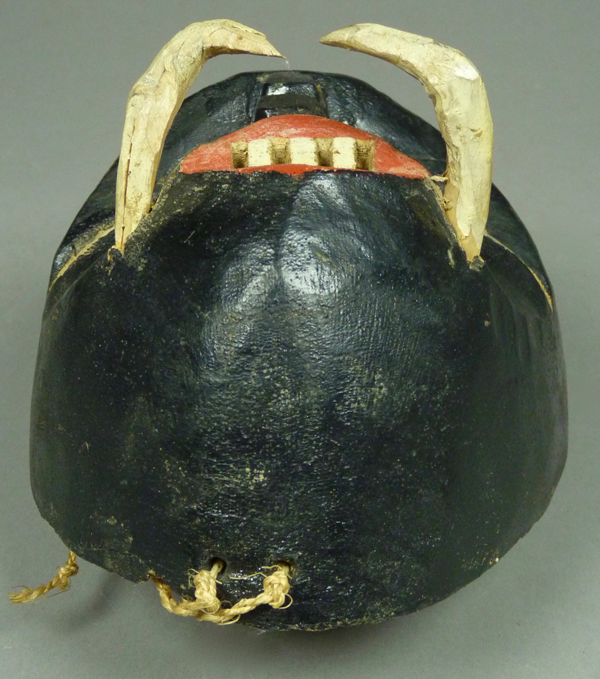 44-50)—”The Tusked Negrito Mask of Oaxaca.” The authors began by noting that these are but one example of a larger class of darkly colored masks worn by “masked buffoons” who “act as clowns, masters of ceremony, and policeman during the ceremonies (page 44).” Tusked Negrito masks are used in Zapotec towns in the Mexican state of Oaxaca.”They usually appear in pairs accompanying the Plume Dance” and these masks can also be used in related dances in this region, sometimes in larger groups. There are similar snouted masks that lack tusks in neighboring communities. The authors speculate that the Tusked Negrito image may be a survival of some pre-Conquest tradition. 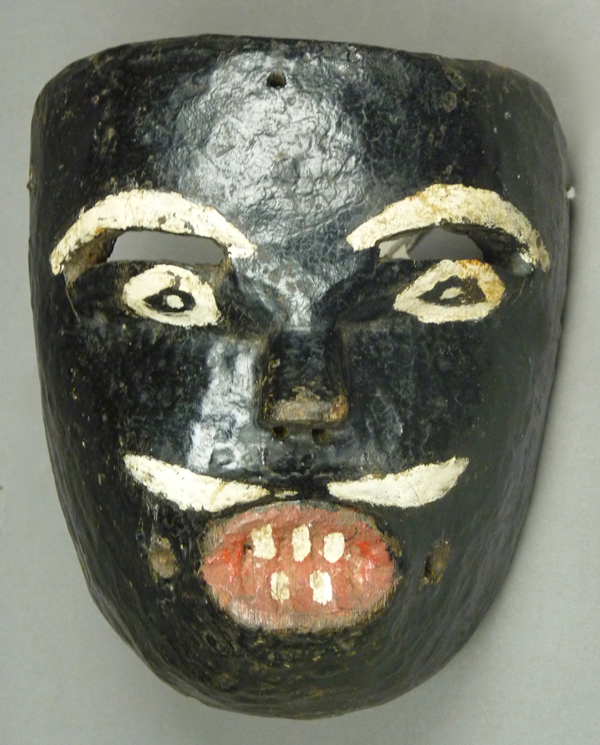 In earlier posts I have shown other examples of masks worn by black-faced ritual clowns, such as Yaqui Pascolas and Negritos from the coastal Mixtec towns. 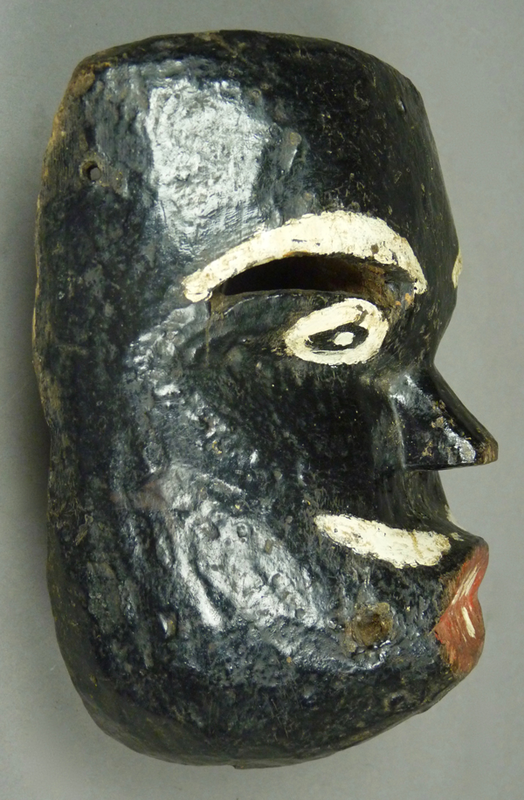 The Tusked Negrito article includes a photo of four Tusked Negrito masks from the Paul Pérez collection. Here is that image. 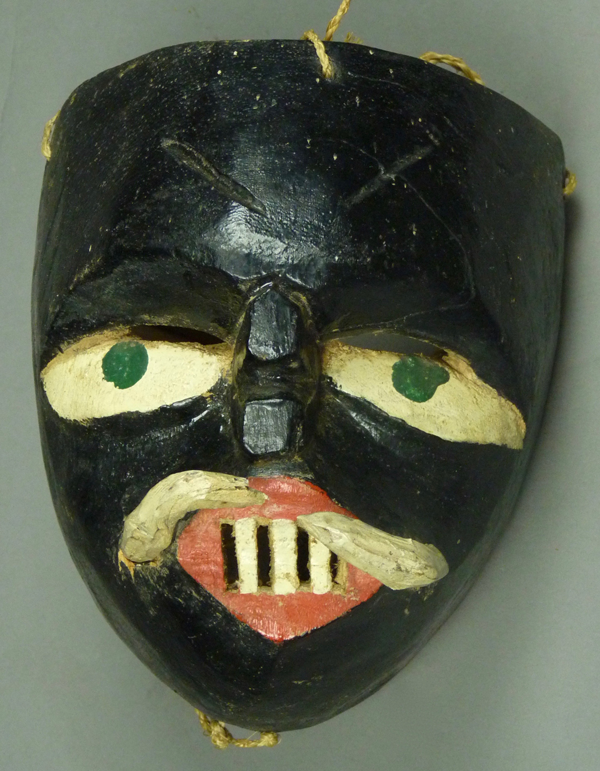 The Paul Pérez collection is currently available for viewing in the Nettie Lee Benson Latin American Collection, The University of Texas at Austin, and in the link that follows you can see color photos of three of those four masks—numbers 20, 78, and 81, plus several others (94 and 176). 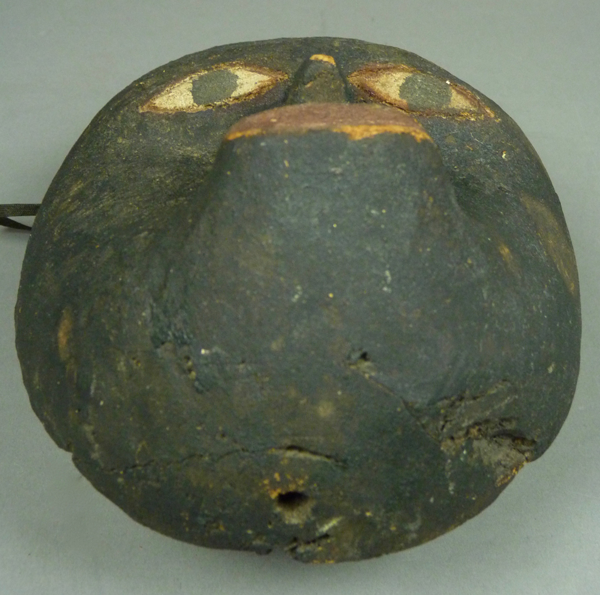 There are many other interesting masks in this collection, of which I would like to highlight just one more—#101—which would appear to be a rather rare example of a Chilolo mask from Oaxaca. In May of 1996 I found a wonderfully worn Tusked Negrito mask in Austin, Texas, at the Tesoros Trading Company, an ethnographic arts store. Here is a link to that store; Tesoros is still there, although I don’t see any masks for sale on their website. Here is that mask. The wooden or leather tusks are missing, but the recesses that had held them are evidence of their earlier presence. 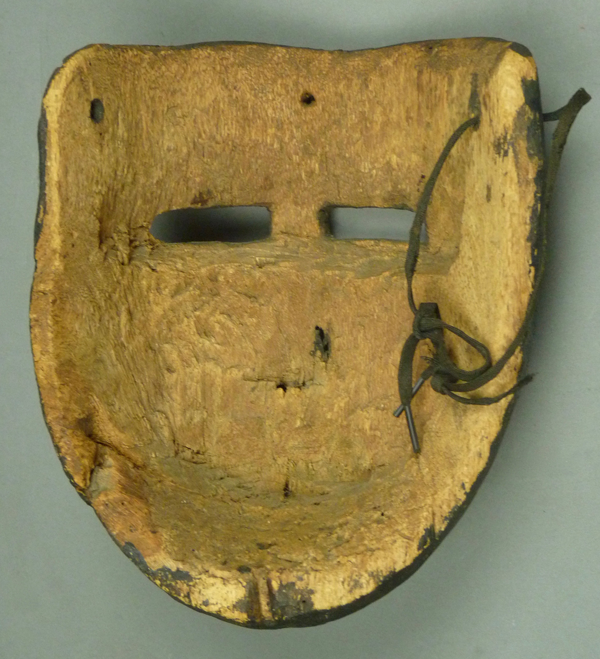 Next week I will show you a nearly identical pair of masks with their leather tusks intact,but this week I want to focus on a variety of examples like the ones in the Pérez Collection photo. 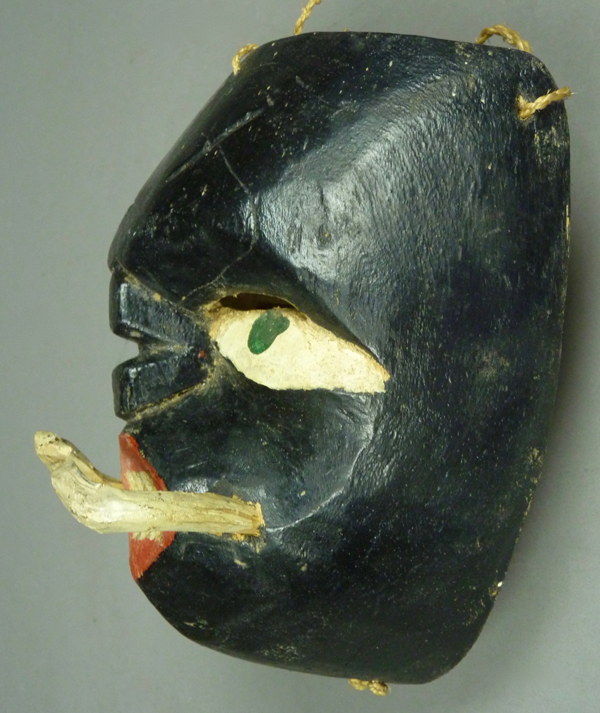 Tusked Negrito masks tend to have snouted mouths. The tusks can be made from leather or wood. 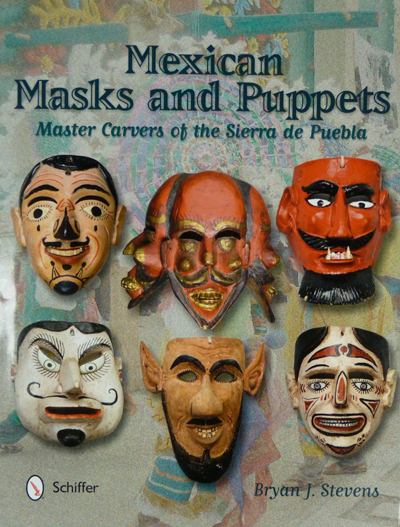 As I will demonstrate over a series of posts, masks from the Sierra de Juarez tend to have an unusual characteristic—they have a hole or holes at chin level to attach what is apparently a neck strap. permitting the dancer to allow the mask to flop down on his chest, upside down and with the back exposed, during periods between performances. I don’t recall masks with this feature from any other parts of Mexico, but you will find evidence of this feature on all three of today’s masks. In the present case the wood split along a line adjacent to the chin hole, and only a cross-sectional view of the hole remains. 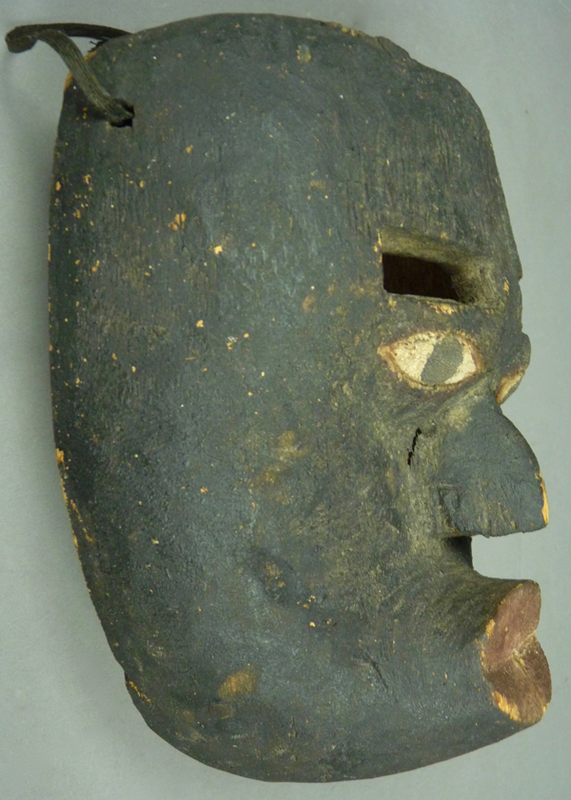 This mask is 7 inches tall, 5½ inches wide, and 3 inches deep. The back is darkly stained from long use. The Tusked Negrito dancers wear elaborate costumes. Here is a Youtube™ video of them dancing in Yalalag, Oaxaca. They are wearing masks with tusks. I note in this video that they are referred to as “Negritos collmilludos.” “Collmilludos” means fanged or tusked. Here is another video of dancers from Yalalag, Oaxaca. In the group still photo at the beginning, the masks lack tusks. I found the second mask on EBay™ in 2007. 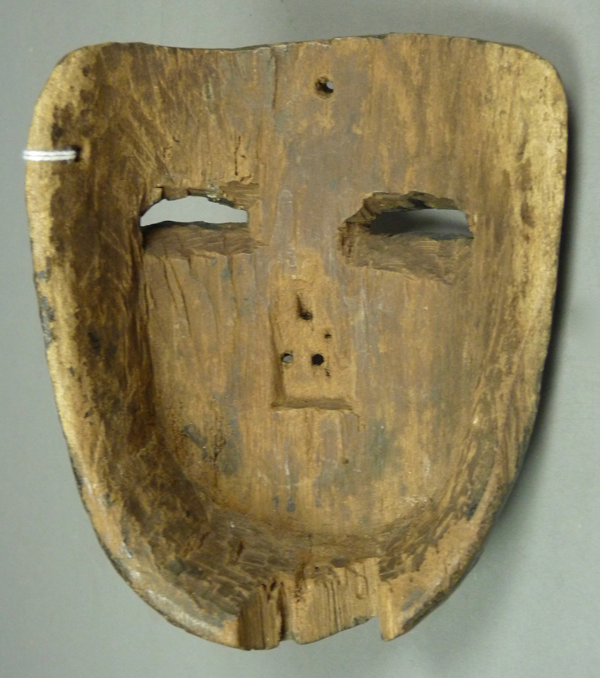 This mask too has marked patina from age and use. 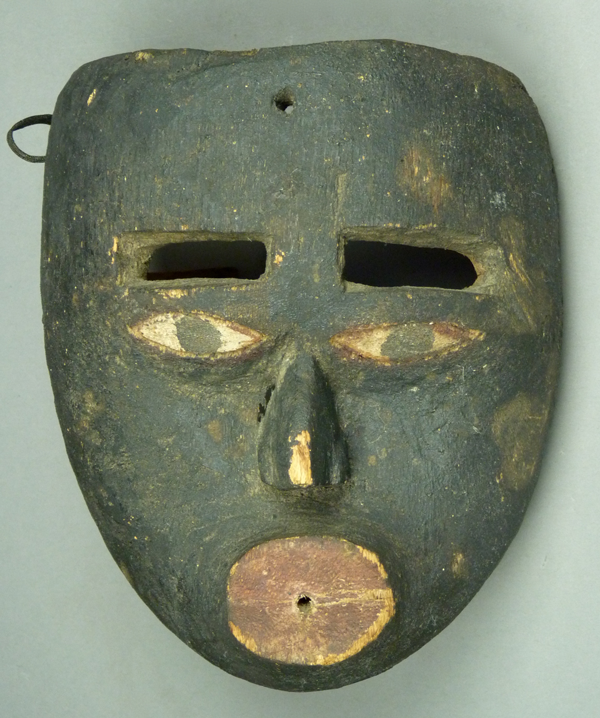 At first glance, one notices the absence of tusks on a mask that has the typical snouted mouth of a Tusked Negrito. Then one recalls the example from the Pérez Collection that has feathers instead of tusks. If there were feathers, they left almost no trace. However, close inspection reveals a bare spot to the viewer’s right and a small irregularity at the same place on the left, possibly glue residue, so I suspect there may have been feathers there, but maybe not. In any event. I really like the snouted profile of this mask. The bare spot on the left side of the snout. The irregularity on the right side of the snout. The hole at chin level for a neck strap. 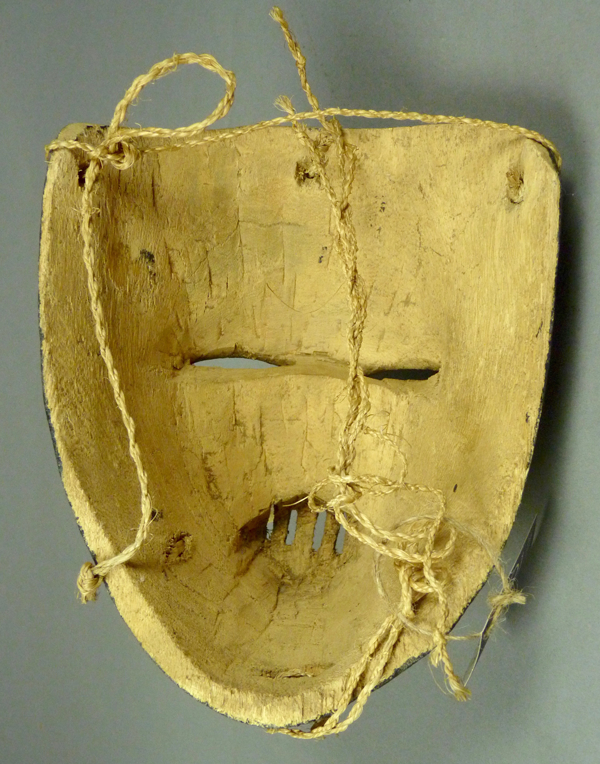 This mask is 7½ inches tall, 7 inches wide, and 3½ inches deep. The back shows obvious staining from use. I found the third mask at the Indigo Arts Gallery in the Philadelphia (Pennsylvania) area, in 1996. It was said to be from the area of Ayutla, Oaxaca. Indigo Arts is also still in business, and still selling Mexican Masks. 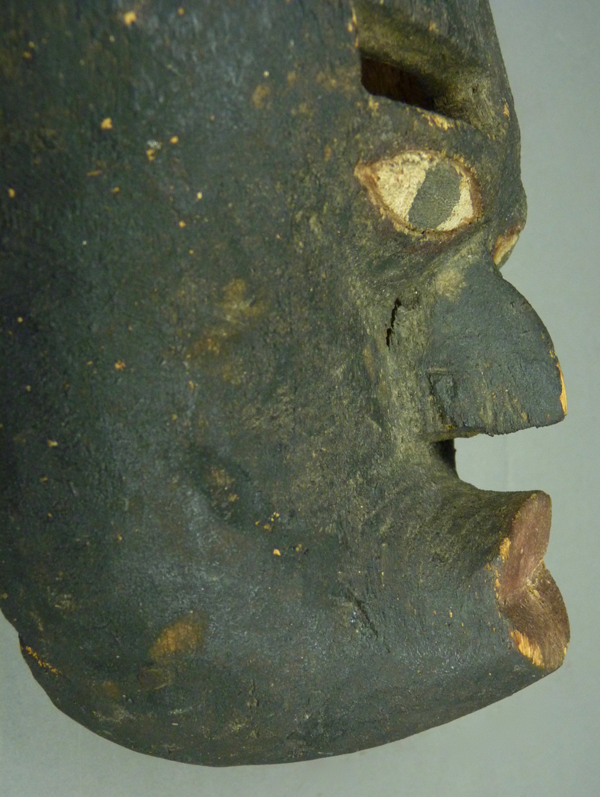 This example has carved wooden tusks, and a mouth style that one often sees on Tusked Negrito masks from this region. This mask has a very unusual stylized nose, supporting the idea that Tusked Negrito masks may represent pre-Columbian gods. Here is an intact neck strap, attached at chin level. 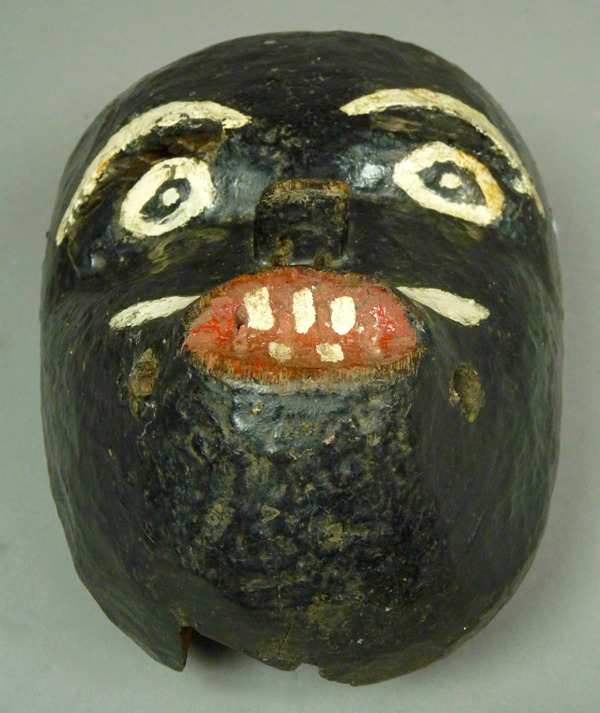 This mask is 7½ inches tall, 6 inches wide, and 4½ inches deep. This mask has moderate staining from use. 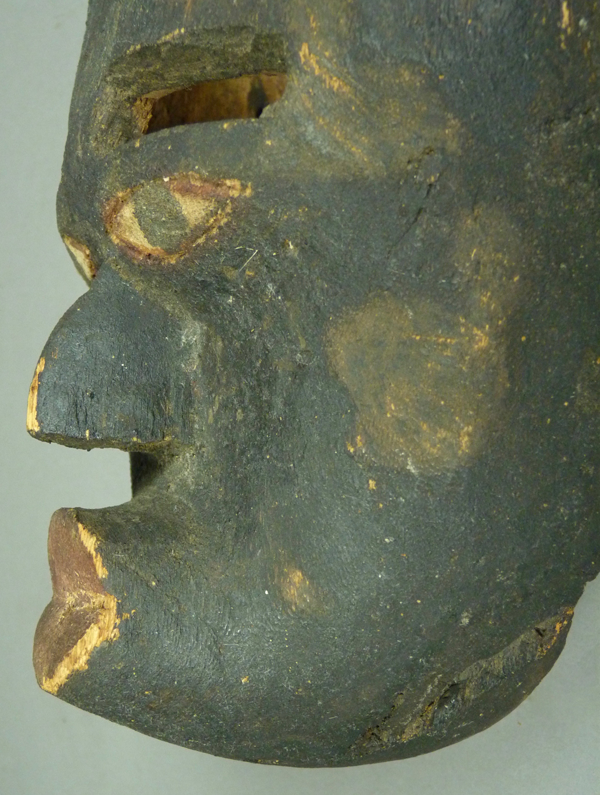 Next week we will see four more Tusked Negrito masks from the Sierra de Juárez of Oaxaca.